So far R2ttl3sn2k7 has created 3 blog entries. Come celebrate Bowser’s birthday, and help us create Bowser’s Peace Sanctuary, a judgment free, safe place to experience, connect, and heal with nature. Here you will find a chance to sit with the spirit, that is nature and Mother Earth, and some of her creatures. Our experience is that this connection is vital to well-being, and we are creating a peaceful place where people can experience a guided tour to meet Bowser, the American Black Bear who shares his amazing spirit to help us all contemplate a different perspective. You can also meet, feed, and get lost in the powerful presence of Billy & Bambi the American Bison, as well as several horses, and our wonderful pack of Great Danes. Our vision for Bowser’s Peace Sanctuary is to encourage anyone that is unhappy, hurting, depressed, overwhelmed, feels like the world is crashing in on them, full of rage, struggling with any addiction or otherwise hopeless to please ask to take a break and a breath in the peace park. We ask no questions, offer no diagnosis, no label, or naming of what is wrong, for we are not counselors, therapists, or tied to any group except peace and love; although, if you ask we can direct you to someone that knows more than us about formal treatments. On Saturday, May 26, 2018 from 9:00 AM to 6:00 PM we will be beginning to build and plant a meditative park together, adding fencing, pathways, benches, and garden beds, as well as improving Bower’s pen both for his benefit and for the comfort of visitors. If you would like to help create the peace sanctuary, you can donate to our GoFundMe page, or lend a hand and meet new friends at 34080 Rattlesnake Hill Road, Tecumseh, OK 74873. News OK article August, 2017. In this intimate production, an Osage chainsaw artist lives deep in the woods, sneaking into Pawhuska, OK, at night to secretly carve animals in tree stumps around town. No one has seen him in years and many people believe he is a ghost. When a woman decides to track down the artist in the woods, she discovers much more than just a ghost story. Russ Tall Chief (Osage) is the Director of Student Engagement, Inclusion, and Multicultural Programs at Oklahoma City University. He is the author of Jacobson and the Kiowa Five, a play published in celebration of the Oklahoma City Theatre Company’s four-year anniversary of the New Native American Play Festival. He is also a Taildancer in the In’lonshka Osage ceremonial dances and nephew of renowned Osage ballerinas Maria and Marjorie Tall Chief. Stan Pace and his wife Shana live on land near Pink with their chickens, cat, several Great Danes, a sheepdog, a quarter horse, a draft horse, two bison and a black bear. In the past the Paces have also had rabbits, sheep and elk. Shana breeds Great Danes and Stan is an artist. He makes sculptures out of cement and carves wood, both with wood carving tools and with a chainsaw. Stan picked up wood carving four years ago and has been doing personal work and for his company, Bowser’s Chainsaw & Wood Carving, which is named after his black bear, ever since. 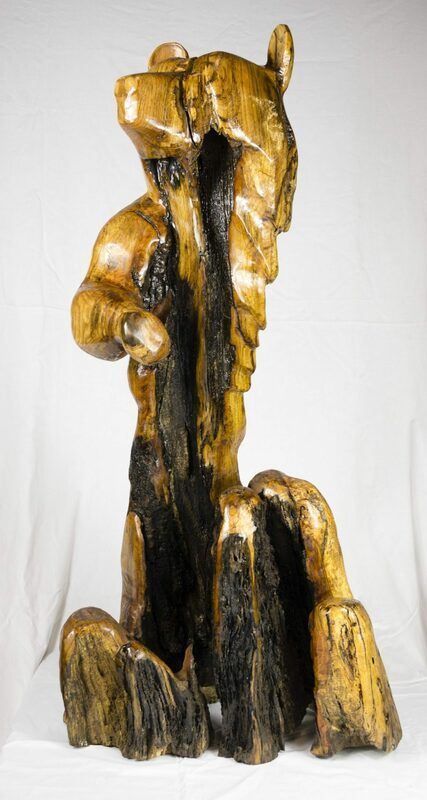 He also does demonstrations of his chainsaw carving and has been a part of Tecumseh’s Frontier Days in the past. His work was featured in this year’s Rotary Club Art Show at Tecumseh City Hall. “I love meeting the people in Tecumseh,” Stan said. Before he began his wood carving business, Stan was a concrete sculptor for 24 years. He made things like swimming pools, fountains, statues and concrete molds and stamps. Some of his concrete work can be seen at the Oklahoma City Zoo. While he still does concrete sculptures, they are now more on an individual, commissioned artwork system than commercial, mass-produced jobs. When Stan isn’t doing his artwork, he’s caring for and spending time with his animals. Their sheepdog, Simon, is now more 15 years old and retired since they no longer have sheep. When they had rabbits, the rabbits would cuddle Simon in the winter and allow him to watch over them. Now the chickens do the same thing. “He’s got a true shaman spirit,” said Stan. These days Simon just guards Stan’s workshop and the henhouse with help from Faith, one of Shana’s Great Danes. 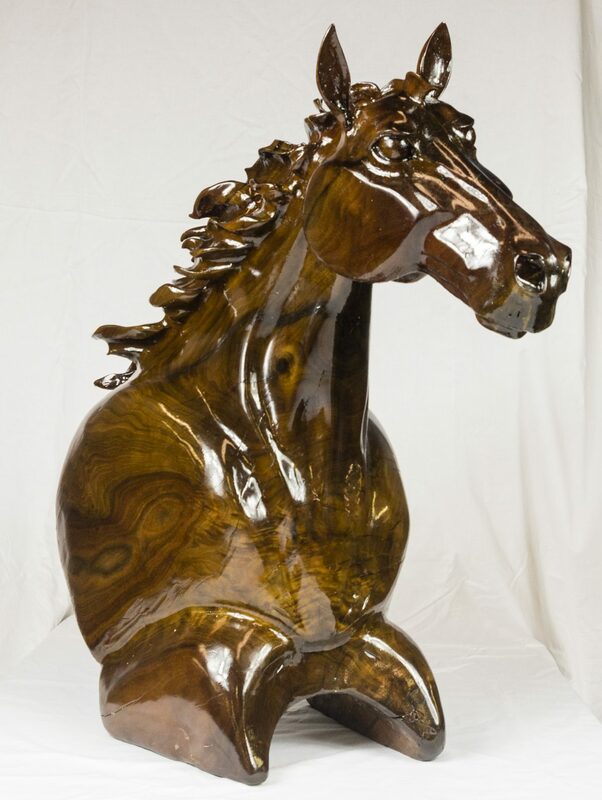 The Paces’ quarter horse is named Takoda, which means “dancing girl” in the Lakota Sioux language, because she gets nervous and “dances” when walking in the woods. Stan is currently training their draft horse to pull logs out of the woods for him after he chops them down. Her name is Wachiwi, which means “friend to everyone” in Lakota Sioux. She is so named because she gets along well with all the animals on the property. His two, one-year-old bison, Billy and Bambi, are somewhat rare for the fact that they have no cattle genetics like many bison today do. He got the pair from Bowser’s veterinarian, Gerald Parsons, who practices in Stratford and raises bison. The Paces got Bowser when he was a ﬁve-pound, eight-week-old cub and bottle fed him for several months after that. Bowser, now ﬁve years old, lives in a large enclosure in their backyard. They are currently raising money and supplies to expand his area to a full acre, which will include a pond so he can swim. Bowser is now 6 feet, 6 inches tall and weighs about 450 pounds. His size doesn’t stop Stan from feeding, brushing and playing with him inside the pen. He said that before he brought Bowser home, he did research on what makes pet bears turn on their owners or accidentally injure people. The most common problem was trying to train the bears to do things and making them do things they didn’t want to do. “It’s like a commitment. Like if I’m going to spend this time with you, then it’s going to be over when you’re ready for it to be over. It’s so much easier,” Stan said. The only thing Stan has trained Bowser to do is to not bite when they are playing, similar to how puppies are trained. They also had Bowser declawed to protect from scratches and to keep him from getting out or having to put in a concrete ﬂoor, which wouldn’t be good for his feet. Stan brushes Bowser in the summer to help him get rid of the excess winter coat on his body. He saves the hair and sends to it someone who spins it into yarn. He braids the yarn with hemp rope and makes bracelets to raise money for Bowser’s new enclosure. Stan said the bracelets are a reminder to be mindful and thankful. The bracelets are now all over the world. Pace completed and delivered this piece. May, 2017. Watch this video in which Pace quietly walks all the way around the angel. May the experience give you a feeling of peace. Small carvings like this feather are available when Pace does live carving events, or you may contact the artist. Cow Bust Sculpture — Finishing touches shown here. More images coming soon to the sculpture gallery. Most pet owners have a close relationship with their animals. However, Bowser isn’t your average pet. He’s a 4-year-old black bear, standing about 6 feet, 6 inches when he’s on his hind legs. He currently weighs about 400 pounds, and he is still growing. Bowser’s owner Stan Pace has been fond of bears since his family took yearly vacations up in Minnesota. About four years ago, Pace got his wish. Pace brought Bowser home when he was a couple weeks old. Since then, they’ve had a special bond. Bowser eats like the growing boy he is. He said, “He’s a very dainty eater. His natural diet is fruit and berries. When kids come out he’ll eat grapes one at a time. If you give him a whole thing of grapes he’ll still eat them one at a time. He doesn’t like potatoes. If you give him chili fries, he’ll lick the chili off the fries. To beat the heat, Bowser spends a lot of time in his pool.Pace brushes Bowser daily. He will then have the hair he collects made into yarn used in various projects. “Sometimes I’ll come in here and just his nose will be sticking out of the water,” Pace said. Bowser has plenty of companions at the Pace residence. There are chickens, horses and Bowser’s favorites, dogs. 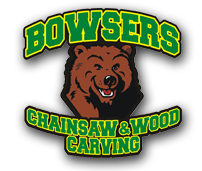 When winter rolls around and it’s time to hibernate, Bowser will seclude himself in his den, but will keep a close eye on Pace’s woodcarving projects. Many would be intimidated by the size and strength of a black bear, but Pace said he and Bowser understand each other on a spiritual level. Menu, gallery, and other links will be up soon. Thanks for your patience.